Last year I really wanted to make my own Advent Calendar, but time got away from me and I wasn't able to. This year I'm vowing to start early and get it done! I've narrowed it down to wanting something that can be hung. 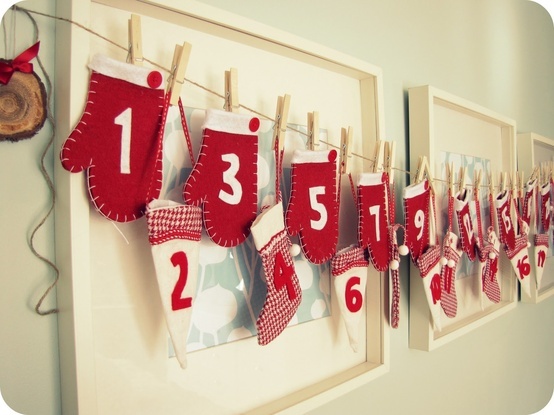 (banner style) I'm drawn to this Martha Stewart sock advent calendar, and I also love this similar style, but with mittens. 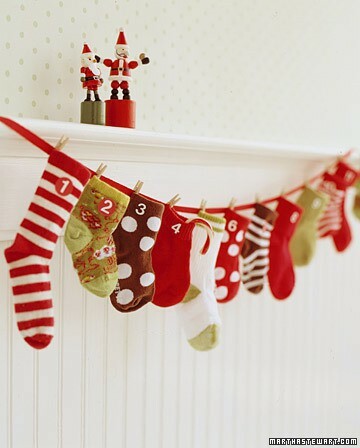 And then there is this cute idea. I can't find the original source, but it's re-pinned all over Pinterest. I think it would be easy enough - a painted piece of wood, 24 painted clothespins, and some cute wrapped gifts. I'm trying to decide what Soren would enjoy the most, but I'm quite sure he will like anything that is colourful and involves presents! Any tips or ideas? I'm hoping to tackle this project on the upcoming long weekend. Ahh! I love all those! 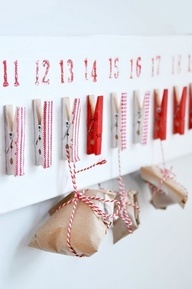 I've been thinking of advent calendar ideas since last year, I'm loving the clothes pin one! I wanted to do this last year too and never got around to it! I have a feeling I won't have time this year either, but someday....!!! i love the one with the mittens! so cute!